Independent music and film companies hit by Enfield warehouse fire | What Hi-Fi? Independent record labels and film distributors are among those counting the cost of a fire that engulfed a distribution centre in Enfield last night. 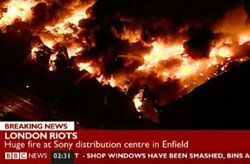 The warehouse, owned by Sony DADC and holding stock to be distributed by the Pias Group, was set alight during last night's riots in London. The British Film Institute (BFI), which has a retail arm selling classic films on DVD, says it has lost all stock held at the warehouse, a figure in excess of 120,000 units. A statement from Yoko Yasukochi at Sony said: "There have been no injuries to employees. The fire is under control but... at this time we are unable to confirm the extent of the damage." Music labels such as Azuli, Domino, Kompakt, Rough Trade and Wall Of Sound are just some of those that held stock, now feared destroyed, at the warehouse. A statement on the Pias Group website announced: "There was a fire last night at the SonyDADC warehouse which services the physical distribution for Pias in the UK and Ireland." Steve Lewis, Home entertainment manager at Artificial Eye, told the Guardian he was however optimistic: "We've been impressed by the speed at which Sony have put their contingency plans into action. Disruption should be kept to a minimum. Our stock is insured."